Call (877) 764-6304 to setup your account. 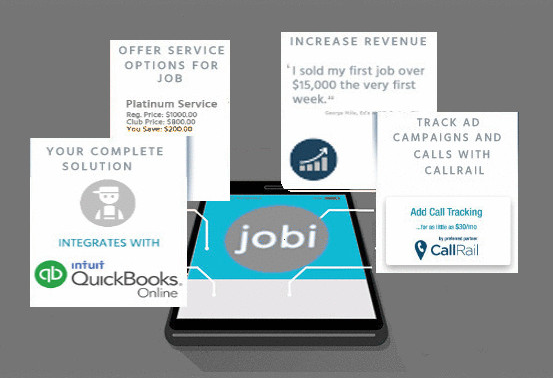 The jobi app features the functions service contractors need to get the job done, including: Dispatch, Scheduling, Tech Tracking, Invoicing, Service Option Creation, Call Tracking With CallRail, Mapping, Quickbooks Integration, Flexible Flat Rate Price Book, Real-Time Sales Dashboard, Admin, And A Free Trial Version With Full Functionality. Contractors using the app and Service Level Option Maker report an average 378% increase in revenue from the same amount of calls. How? using jobi's built-in price level option creator that gives customers a choice of repairs or solutions (example: Platinum, Gold, Silver as well as various warranty plans and more). Our plans are affordable for service contracting businesses of all sizes. Available for Apple iOS and Google Android devices. Origin of the name jobi: Job...plus 'i' for interactive (pronunciation: jobi rhymes with Bobby). The important thing is jobi helps you generate more sales on the same number of calls. Create a steady revenue stream. See real-time stats on sales by tech, service, department. Keep your customer data accessible in the field with a tap. Know which marketing channels are generating sales for you vs. wasting your money. Get listed on the jobi contractor directory. Just a few of the benefits of jobi. Set a convenient time for you for a brief demo.